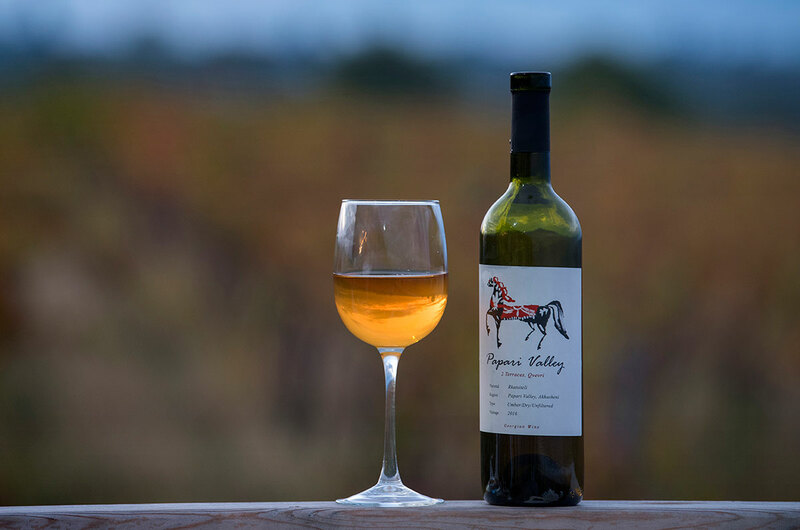 Papari Valley makes natural wines that are among the best of Georgia. They have achieved a cult status in their own country in a few years and their '3 Terraces Rkatisteli' received 94 points in the British Decanter magazine. The wines of Papari Valley are made by Nukri Kurdadze. Nukri is a physicist and has been making wine all his life. Only ten years ago, he decided to become a professional winemaker. He bought two hectares of vineyards in the province of Kacheti, in the Papari valley. Papari means 'the manes of a horse'. The valley got this name thanks to its gentle slopes. Nukri makes natural wines. From organic grapes and with as few interventions as possible. The wines ferment on wild yeast and Nukri does not clear, he does not filter and does not adds anything. Nukri has a total of 21 qvevri's (clay pots) on three different levels in his cellar. On the upper level, the grapes ferment. With the aid of gravity, the must is then transferred to the qvevri's at the lower levels to mature. An innovation that bears fruit. The red saperavi wines have a huge concentration and the orange wines of Papari Valley are remarkably elegant.